In her recent book Forms (2015), Caroline Levine makes a powerful case against using media and literary fictions as direct analogies for political realities. She warns of the dangerous politics, not least a dependence on “acts of exclusion” and a “constitutive outside” that can accrue from such a tendency. Yet, that is exactly what I do in my research around uses of the ‘zombie mythos’ for my explorations of urban spaces on foot. Phil Smith walks like a zombie. Indeed, I have exaggerated the process; rather than stepping back to examine the containing and dividing forms that are at work in the fictional ‘living dead’ world, I step further in. I immerse myself in its ‘characters’ and narratives, in order to rifle through these fictions for categories of space, origin narratives, abject identities, and the tools for an infected phenomenology that owes rather more to John Carpenter than Martin Heidegger. By excessively performing the analogy, the fictional to real parity breaks up on its fictional side. I track the movement of its fragments – their attractions to and collisions with each other, their patterns of containment and tangential trajectories – to reveal forms in the real world, exactly the finessing of structures that Levine advocates. Walking towns and cities in a zombie-fiction – I don’t bite or moan or stalk, but look through the eyes and actively feel out with the imagined bodies of agents either side of the life/death divide – I play out that most tedious of dériviste tropes: the navigating of one place (say, Taunton) with the map of another (say, a zombie-infected Fort Myers). My walking has revealed a taxonomy of spaces gathered from movie and comic zombieland: porous bunkers, ecstatic grids, voracious courtyards, and so on. Checking and articulating the findings of my journey against zombiespace, an unstable overlaying is often suggestive of the working and shifting of social forms and structures in ‘meatworld’. Things are always changing in zombieland. Despite the surprising coherence of the Romero living dead – slow, democratic and with returning consciousness – they have, from the very beginning, demonstrated a proclivity for breaking the rules and then repairing them. 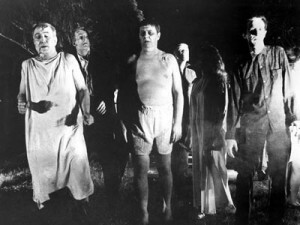 In the originary film Night of the Living Dead (1968), when director George Romero was establishing the rules of the genre, he was, as Evan Calder Williams notes, “already screwing around with those very rules”. Zombie products are still subject to impulses that can be tellingly wonky and contradictory. Even in a big budget project like the prequel tv series Fear of the Walking Dead (screened 2015), there are revealing wobbles. The obligation to stay reasonably consistent to its ‘Walking Dead’ mother-narrative places a torque upon the new series that generates at least three novel twists to key parts of the Romero mythos: masses, media and military. In its depiction of the US military, Fear echoes a sense that in living dead narratives the fictional survivor is getting ever closer to the zombie and that the zombies “are getting closer to the ‘us’ that is them”. As far as the National Guard in Fear are concerned, the local civilians are simply zombies in waiting. Rather than providing protection, they behave like an army of occupation, caging the community and patrolling the streets; not to keep the zombies out but to keep the living in their place. This is a strategy that the soldiers bring with them: in an armed society, the populace are a de facto enemy of its own army. Unlike the smothering military presence, the media are notable for their absence. Broadcasts end, almost without comment. The familiar device of so many zombie dramas – the TV broadcast, survivors gathered around a set – is missing; instead the characters sit on the roof of their house to get the ‘bigger picture’. In zombie narratives the way the living dead horde forms is often telling; Fear adds a new element to this familiar narrative, which often features as the consequence of a self-destructive state brutality and stupidity. In Fear, the consequences of short-sighted actions of control and containment are sharpened by a political element – a fascist chicken coming home to roost – in the ‘massification’ of the living dead: in order to help his family, Daniel, patriarch of the Salazar family, living by the wisdom and skills acquired as a torturer for a US-supported El Salvadorian dictatorship, releases thousands of zombies confined by the army in a nearby arena. Daniel’s self/family-interested brutality, the return to home ground of the US’s support of violent authoritarianism abroad, is the release mechanism for the dead mass. The show signals, in no subtle way, that the legacy of past US foreign policy is unnaturally alive at home. No longer with the liberating ordinariness of Night of the Living Dead, nor with the rebelliousness of the black working class project dead of the original Dawn of the Dead, the horde of Fear is a state-corralled, self-consumed, hyper-exploited mob manipulated by a fascist. Perhaps this is a sign that the sub-genre is losing the invigorating revolutionary morbidity of Romero’s corpse-crowd and that its central role in the dramas is being increasingly taken up by an embattled elite of the living, who, according to Deslandes & Adamson, “continue to operate within the discourses of the old world – consumption, competition, consumerism”, spreading disaster and gambling everything on the efficacy of their own groping for dominance. A viewing of the Fear of the Walking Dead series adds three extra taxonomic satellites to my zombie orrery. Joining zombie pens and ecstatic grids is, first, a media silence that now invites me to interpret global forms from rooftops and other viewpoints. Secondly, a 1% state allows me to realise myself as an enemy within, to internalise Levine’s “constitutive outside” of my oppressive totality. And, finally, I can walk in relation to a new kind of living dead: a manipulated horde, a (non)human ‘dust’ antipathetic to that community which Lee Miller had detected among the zombies. Still, to traduce Levine’s stricture against homology, it is hard not to walk more warily now in relation to that horde, in the light not only of Fear, but of the momentum of a proto-fascist US Republican candidate with mass support and the rise of the forces of nationalism and populism in Europe, feeding upon the displacement of millions by invasions and wars in the Middle East. 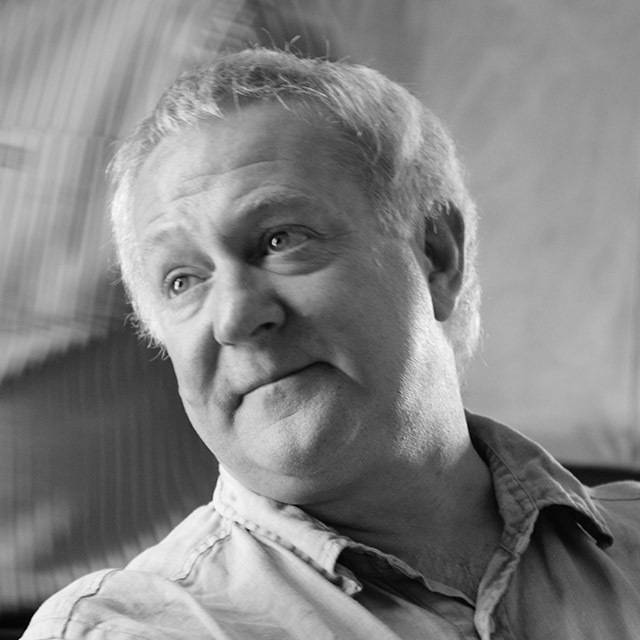 Dr Phil Smith is Associate Professor (Reader) in Theatre & Performance at Plymouth University. He is the author of The Footbook of Zombie Walking (Triarchy Press, 2015) and a chapter in Generation Z: zombies, popular culture and educating youth (Springer, 2016). 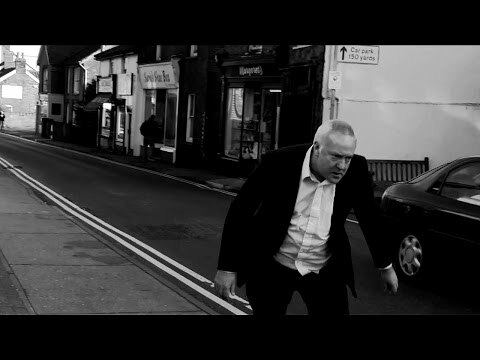 Phil is also the co-editor of a Special Issue, with Lee Miller & Roberta Mock, on Zombies & Performance for the journal Studies in Theatre & Performance (2014), which includes his own essay entitled “Performative Walking in Zombie Towns”. This publication arose from a symposium at Plymouth University in 2013 on “Zombies: Walking, Eating and Performance”.